This web page was first mounted on November 6, 2011 and last updated on April 8, 2019 by Sheila Schmutz. The Large Munsterlander Association of Canada (LMAC) was formed in late fall of 2011, after it became clear that several members of the executive of the Large Munsterlander Club of North America no longer were willing to abide by the Animal Pedigree Act of Canada. LMAC continues the long tradition of breeding only proven hunting dogs began in 1977. It officially began on January 1, 2012. 1. Appoint a new president and vice-president from among its Canadian "regular members" and a additional officer positions: secretary, treasurer, registrar (and any others established by the board); these latter offices may, but need not, be filled by board members. 2. Appoint any addditional members as officers. Hello everyone! I am putting my name, Tracy Fisher, in the hat to run for the Board of Directors for the LMAC as I have enjoyed the newsletters over the years and I know only too well how small organizations such as this need active participants. I am a veterinarian by profession and have been practicing since 1997. Most of my patients are dogs and cats but a significant number are birds, small mammals, reptiles and some wildlife. My husband Rick and I have been Large Munsterlander owners since Sunnynooks' Purdey took over our house in 2002. We currently have two LMs, Bear Hills' Briley and Muddy Waters' Dora. 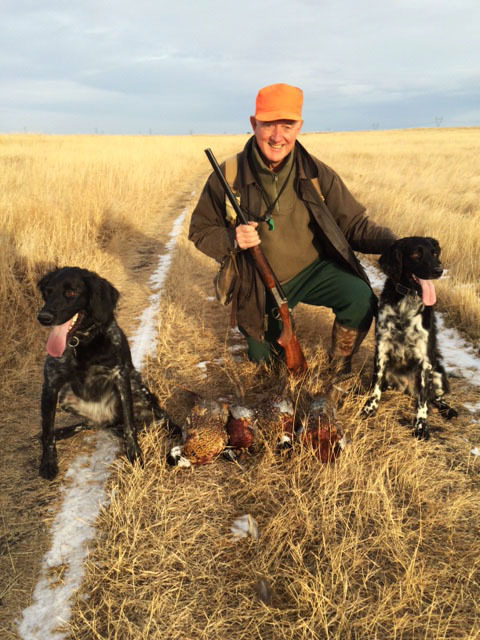 We spend most of our fall hunting upland birds, particularly pheasants, but also enjoy some waterfowl hunting. 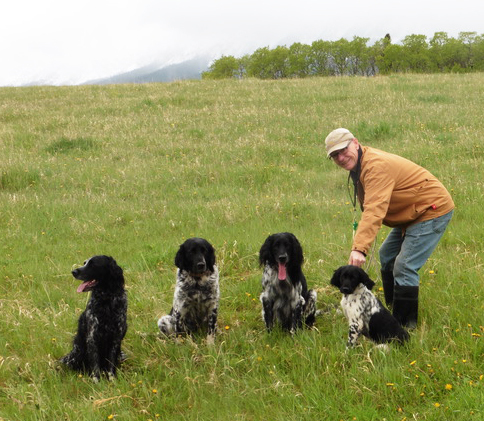 Rainer in 2015 with (left to right) Hunt Mountain's Doonerak (Drake), Snowy Oaks Fen, Sunnynook's Rook, and Sunnynook's Erro. Rainer Knopff, a professor emeritus of political science at the University of Calgary, has been hunting with pointing dogs for over four decades. He switched from Setters to Large Munsterlanders in 1990, and the entire family has enjoyed the companionship and field work of these versatile black-and-whites ever since. Rainer and his sons, Kyle and Joel, typically run a small pack of LMs. Rainer became LMAC president in 2015. Photo: Rainer Knopff with the family pack. Please consider this email as notification of my willingness to stand for the position of a director for the LMAC. 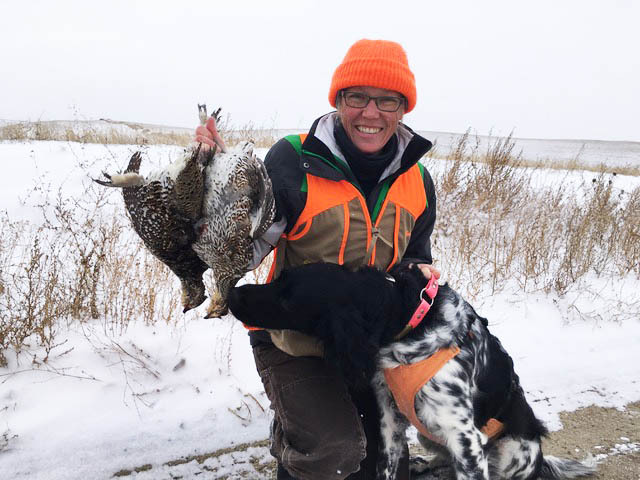 hunt pheasants and grouse with "Minnie", and also my son Lorne and his LM "Maggie"
Hosted the 2015 LMAC summer gathering. I am pleased to stand again for a Director position on the LMAC Board of Directors and would be willing to continue to serve as Webmaster. My husband Joe Schmutz and I founded the Large Munsterlander Club of North America (LMCNA) in 1977. Sunnynook Kennel celebrates its 40th anniversary in 2017! I have actively participated in the breeding decisions and whelping of pups at Sunnynook Kennel. We are committed to continue breeding for some years because the dogs have always been, and will continue to be, a huge part of our lives. We take breeding very seriously. I'm a geneticist and do not hunt, but help train the dogs, especially the puppies. I only ran a pup once a NAVHDA NA test. For many years I acted as Test Secretary and "cook" at the annual field tests held near Saskatoon. I have served as Webmaster of LMCNA and LMAC since the website began. I have served as Secretary in the past and again recently for LMAC, and in the early years of LMCNA as the newsletter Editor. I firmly believe that the Large Munsterlander should continue to be first and foremost a fully versatile hunting dog and to that end we will breed only dogs that have passed a hunting level test. 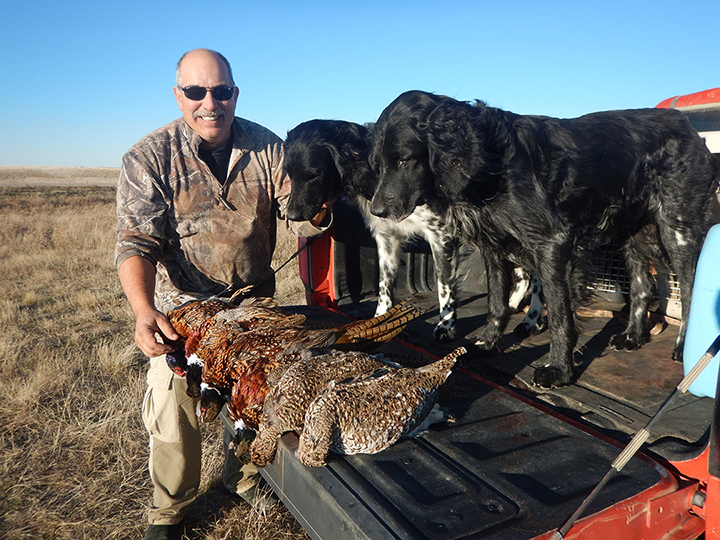 Rick Schryer with Saskelkana's Bones and Sunnynook's Cue after a hunt with his friend Steve, pheasants and Ruffed grouse. 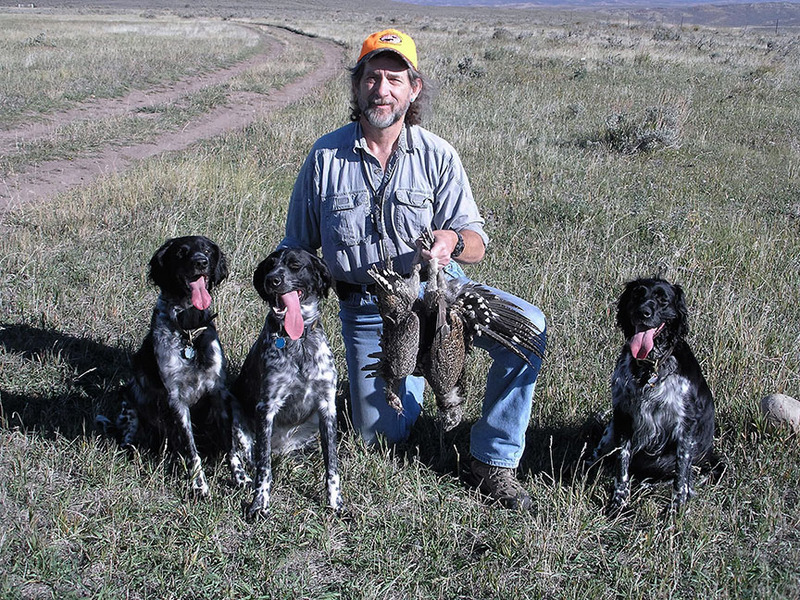 My name is Rick Schryer and I have been hunting birds with dogs since I was 12 years old. I grew up in northern Ontario where we used black Labrador retrievers. I moved to Saskatchewan to complete my Ph.D. in aquatic biology. 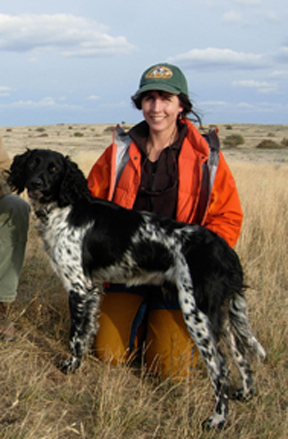 It is in Saskatchewan that I was introduced to versatile hunting dogs and specifically Large Munsterlanders (LM). I now own three male LMs from three different kennels. We hunt a variety of waterfowl and upland game in varying conditions that provide a challenge for me and the boys. 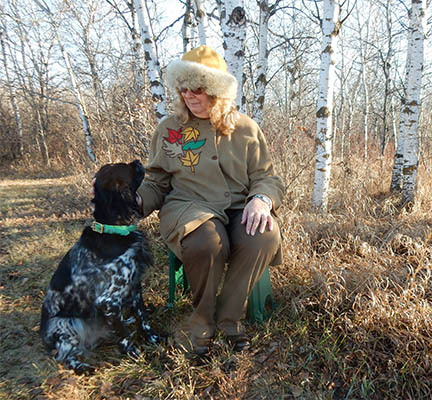 I have been President of the Saskatoon Gun Dog Club for the past several years and actively participate in club sponsored events such as demonstrations, training days and field tests. I have been a VHDF-Canada judge for the past to years. All of my dogs have been tested at all three levels of NAVDHA or VHDF with good results, and have had conformation evaluations. Scotty has also passed the VHDF-Canada blood tracking test. My oldest male Bones has sired 5 litters and received 2 breeding awards and Cue is awaiting his first litter. Training my dogs and helping other owners with their training is one of my passions. I would be proud to be a board member for LMAC. My name is Janice Staley, my husband is John Staley the newsletter editor and I would like to continue as director for LMAC, for a second term. We have been involved in LMCNA since March of 1990 when our first Large Munsterlander, Snowy Oak's Dove, was born. We have been the proud owners of 7 LMs and I have actively participated in their training, testing and hunting. Our youngest, Bear Hills' Ember is the foundation of our Eagle Rock Kennel providing 6 healthy and energetic puppies on January 16, 2018. My back ground as a Labor and Delivery Nurse came in handy. I participated in the annual club hunts held in Saskatchewan for many years. While there I have had the opportunity to observe a large number of LMs in both the field and around the house. During those hunts I have taken hundreds of photos and hours of video of LMs and their hunting partners under all conditions from way too warm to 3 feet of snow on the ground. I've helped John train and handle 5 dogs in NAVHDA NA tests and VHDF HAE and AHAE tests. While John was working out of town I have taken on a lot of the training in preparing Ember for her VHDF AHAE test. I feel that at this time in my life I have the time available as well as the desire to become actively involved in LMAC. One of the fundamental principles behind LMAC is the control the club maintains on the breeding program. This is what first attracted us to the breed. Well that and the reputation for ability after the shot, we had an English Setter who refused to retrieve. I've been helping my husband with the newsletter for many years helping with proof reading. I'm confident I'm up to date on the issues facing LMAC. I will be accessible and responsive to all members. I will respond to all e-mails and voice mails (that’s if you have to leave one) and I am easy to contact by phone most of the time now that John and I are retired. I look forward to working with the other members in supporting the dogs that have become such a large part of our lives. Sheri Hallwyler lives in Oregon City, Oregon and has had LMs for 20 years with her husband Rick. Our kennel is Muddy Waters Kennel and we have had 4 litters which contributed 44 pups to the gene pool. We have had several Large Munsterlanders, with which we hunt upland and waterfowl. I have run several dogs in upper level hunt tests so I have the full picture what is needed from the point of view, of a breeder, hunter, trainer and test participant. I also favor breeding hunt-level tested dogs and have seen the pros and cons to this, especially while I have been the Total Dog Profile keeper and involved with the breeding choices for LMAC and the previous LMCNA dogs. I believe I can provide the club with a well- rounded point of view to help maintain this breed we all love so much. The editor will be preparing newsletters for mailing about March 21, June 21, September 21, and December 21. Please email him stories, photos, news items, etc. at least two weeks in advance of these dates. Members receive quarterly newsletters by email.